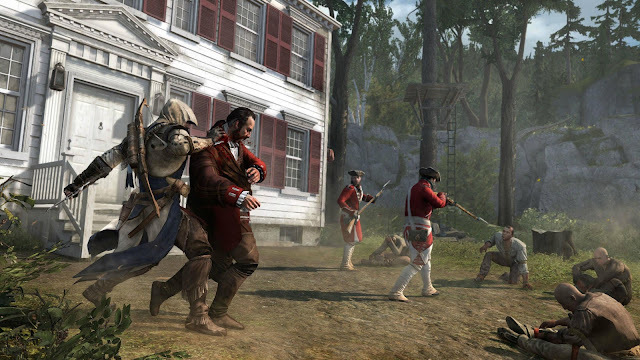 Picking up from an equally intense predecessor Assassin’s Creed: Revelation, comes a whole new chapter, Assassin’s Creed 3. Just a little backtracking, we were left with Desmond running off with his father together with Shaun and Rebecca. Relationship between Desmond and his father have been straining, but nonetheless still preserving. Likewise, they continue with their journey as we follow glimpses into Desmond's life. But Desmond is not the main guy. He's just a link which rather geniously binds all the Assassin's Creed franchise titles together through a system called the Animus. There, we venture back to the past taking the form of Desmond's ancestors - 15th-century Ezio, the quite a legendary Altair, and now, Connor the British-Native American. However, as much as we would love to jump right into the Connor we grew to admire from the many trailers we see him skillfully traversing, we're stuck to really learn from the roots of its family history, right at the start from his British father Haytham Kenway. 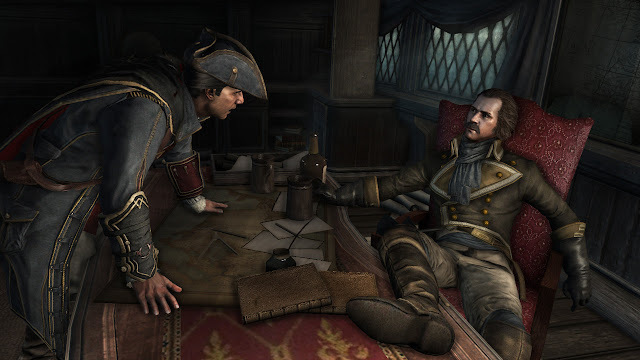 Long story cut short (it's actually very long btw), Haytham Kenway works under the British government and goes for business to Boston, America. In Boston, Kenway starts wars, conflicts and inadvertently fell in love with a native Ziio. And well, that's basically how it all happened, and came along who we all knew from trailers and sneak game previews, Connor. And that, is who you will all grow to love about. No more spoilers for the game but bear this in mind, if you're a Star Wars fan, you will notice that it’s like the historical version of Star Wars 4,5 and 6. Don’t ask me why but you’ll have to find out yourself. During fights, you'll notice that Connor does not (well unless you go and find one) use those big, long swords anymore. Instead, you’ll now only need to enjoy the sheer sleekness of Connor’s signature Tomahawk axe. Also, no more arm pistols as you'll have handheld pistols, with the classic longbow and arrows. Well, you've got to admit those are pretty old-fashioned to go against gun-wielding guys but, you know what, who cares?! After all, it's the style that matters most isn't it? Oh yes, it's style. And that's where the Assassin's Creed franchise have always stood out. Scaling the walls, silently sneaking behind and above your targets have always been both thrilling and daunting, and at that very moment you leap off the roof in an elegant fashion, then dropping on your target stabbing deep into him with you hidden blade...oh that pure satisfaction. This time around, Ubisoft has took things a step ahead with how you move around. 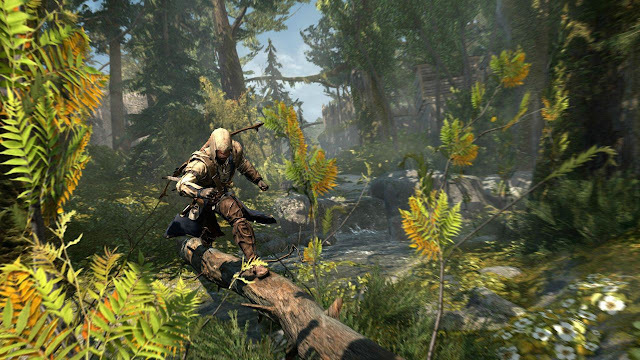 Traversing through trees is now similar to scaling the walls but in a way much more varied, having a new environment ultimately gives a breath of fresh air into the franchise. However, in terms of gameplay, you cannot do things as freely as you used to be able to do in previous Assassin’s Creeds. One example is that you won’t have the chance to swing your axe all around this time, punching citizens as you wish or even to just run around with a gun in your hands. Less liberty in the game I supposed. But that kinda makes sense now that America is much more developed than you know, the 15-th century Florentia. That said, the first 5% of the game may be slightly dull but as the game goes, it gets interesting and Connor is definitely not to be missed. It's a real pity for the slow, sloppy start but if you were to lay a hand on a copy of Assassin’s Creed 3, and persevere till you reach Connor, you'll definitely not regret.